An orange kitten is looking out at some holiday gifts. Inside greeting: Hope your Christmas is filled to the brim with fun surprises! 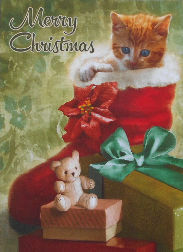 This holiday card is 5" wide x 6 3/4" high. There are 9 cards and 9 matching envelopes in this package.